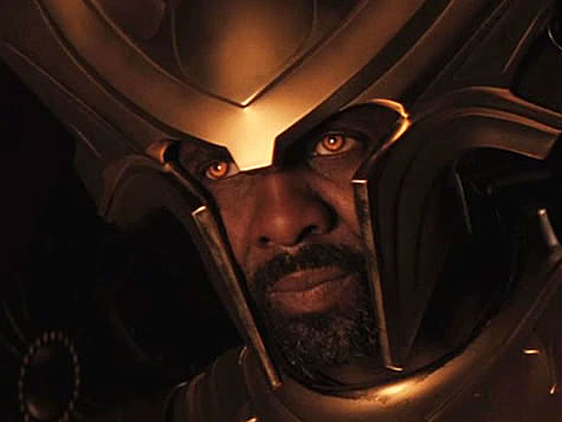 Elba himself described the part of gatekeeper Heimdall in Kenneth Branagh's Marvel Comics adaptation "functional," so it speaks a lot of what he did with the role that he was often mentioned by media and masses alike as a highlight of the well-liked blockbuster. And, indeed, much as he was on the comic page, at a base level Heimdall's part in the world of Asgard is as plainly no-nonsense as his demeanor: guarding the rainbow bridge Bifrost as various other Norse gods pass his way as they travel between worlds. So Branagh was especially wise in casting in Elba, not so much for providing a commanding physical presence but in his ability to say so much with his face and body language without a large safety net of spoken dialogue--and Elba so perfectly embodies the character's stoic, steadfast devotion to his duties to his world and its residents that he emerges as a fascinating and rootable figure in his own. Given how well his Heimdall served his function and then some, it's downright unthinkable that his casting was ever considered controversial due to the (non-)issue of his ethnicity--he simply was the ideal choice for the part.